Talon’s uneven vocals and heady garage band noise is a welcome respite after too many albums that sound either over-produced or consciously fuzzy. 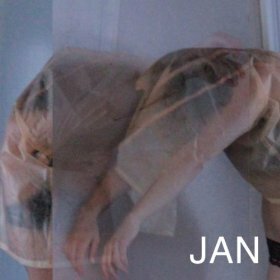 There’s something sonically ’90s about JAN’s combination of distortion, intimately raw lyrics, and half-smirk attitude. Maybe it helps that the producer is John Goodmanson whose other projects include Blonde Redhead, The Gossip, and Sleater-Kinney. “Winter’s Got My Coat” features a violin, but still focuses mainly on dirty guitar noises. The stand-out song on the album is “All Of These Igloos.” It’s more minimalistic and vulnerable, allowing Talon to emerge full-bodied from behind the foreboding noise. JAN’s self-titled debut reminds us of The Raveonette‘s sensual melancholia, yet her soprano voice never allows it to become tiring or overwhelming. Instead of a wall of noise that crescendos and decrescendos into your earholes, it’s the inconsistencies and spaces in between that make this album distinctive.